A new controller and a new system of playing songs — Guitar Hero Live changed too much from last generation to match its predecessors’ success. Last month, Activision confirmed that it would shut down the online servers for Guitar Hero Live on December 1. When that happens, the 500-plus songs featured in the game’s GHTV mode will disappear forever, leaving only the 42 songs featured in the Live component. The end of the service marks the second time that the franchise has been left in limbo after the last entry in the series, 2010’s Guitar Hero: Warriors of Rock, experienced poor sales compared to its predecessors. At its peak, Guitar Hero was amongst the most financially successful franchises in the world. Its simplistic gameplay allowed gamers of all ages to play along, while its diverse soundtracks meant that it catered towards many tastes in music preference. Following Harmonix and RedOctane’s success with the original game, Activision stepped in to publish it and assigned Tony Hawk’s developer Neversoft to develop all future titles. The series has since racked up more than $2 billion in sales across all entries, with Guitar Hero III: Legends of Rock the most successful of the lot. Harmonix would go on to develop the critically acclaimed Rock Band, starting a rivalry between the two series. Both Guitar Hero and Rock Band’s sales slowed down towards the end of the 2000s and by 2011, the two series’ futures were unclear. However, the rivalry was reignited in 2015 when both Activision and Harmonix announced new entries in their respective series. Rock Band 4 promised more of the same, but on a fraction of the budget of the older games, it resulted in a stripped back entry with a soundtrack lacking the big names of past games. Harmonix has continued to support it over the past three years, though, most recently with the outstanding Rivals expansion that new game modes and plenty of free tracks from independent artists. Where Harmonix played it safe, Activision decided to take a massive risk with Guitar Hero Live by completely revamping the title for a new console generation. Instead of retaining the classic five-button layout, the company decided to go with a new controller design featuring six buttons, three black and three white. It was a little closer to the natural movement of playing a real guitar than the original controller layout, but again, it was just another bit of plastic that would end up collecting dust for most players. Guitar Hero Live’s GHTV mode allows you to play its entire library for free, but only by playing whatever song would appear on either of the network’s two channels. 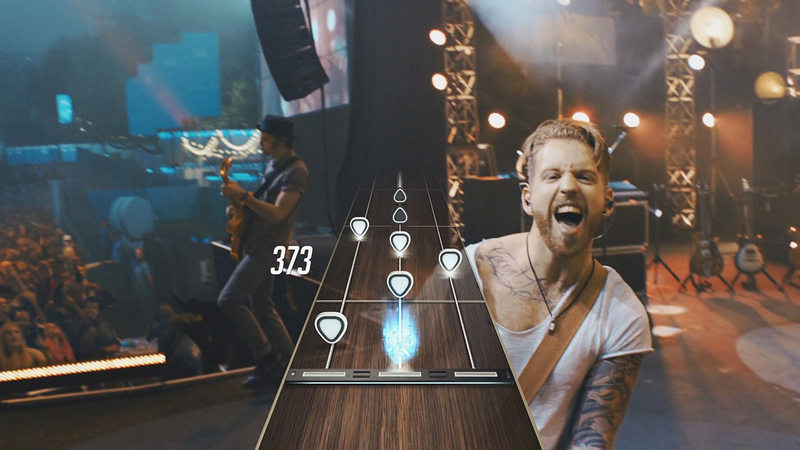 Guitar Hero Live features two modes: Live and TV. In Live mode, players work their way through select series of songs, acting as the guest guitarist in a dozen fictional bands in a live-action concert. GHTV, on the other hand, has two dedicated music channels streaming groups of songs in a structured programming block, just like a real TV channel. Players can, of course, select any song they want at any time, either by using credits earned in game or through microtransactions. The ability to practice songs is a disappointing omission from both modes, particularly when it comes to rehearsing some of the game’s more complex songs. In the age of games as a service, Guitar Hero Live just doesn’t offer enough to keep players returning to the game. GHTV’s level cap was only 20, which could easily be accumulated in a couple of weeks. The head to head mode was buggy; the other player’s screen failed to properly display their performances alongside you, so you couldn’t quite tell if you were winning or losing. These bugs, which had been around since the competitive modes were introduced, were affecting most online sessions. On top of that, the game doesn’t allow you to battle your friends online; you simply had to hope the game would pair the two of you together at the start of a song. It’s disappointing to see just how far the Guitar Hero series has declined. FreeStyleGames founder and game director Jamie Jackson was so proud of Guitar Hero Live when it released, but that enthusiasm didn’t seem to translate over to the game in the months that followed. Now, when the servers are shut down on December 1, all the songs that are featured in GHTV will no longer be playable, as the series’ future once again hangs in the balance. Once the GHTV servers shut down later this year, only Live mode will be accessible. Hope you enjoy FMV sequences and virtual audiences! I don’t want this to sound like I’m attacking FreeStyleGames for trying something new. The small UK-based studio, which also developed DJ Hero, a Guitar Hero spin-off that used a turntable controller to play along to remixes of popular songs, had some great ideas. Unfortunately, we’re now in the age where games are a service that need to be constantly supported by the developers to stay relevant, and that’s where the studio dropped the ball. Ubisoft bought FreeStyleGames out in January 2017, assigning it to develop The Division and its upcoming sequel, virtually abandoning support of Guitar Hero Live. We’ve only seen 19 new songs added to Guitar Hero Live since the acquisition, compared to Harmonix putting out well over 100 songs in that same timeframe for Rock Band 4 owners, a handful of which have been free for owners of the Rivals expansion. Guitar Hero as a brand is one of the strongest franchises of the modern era. Live introduced me to a lot of bands that I have since added to my personal playlists, including Royal Blood, Motionless in White, Slaves, Highly Suspect, Rival Sons and The Gaslight Anthem. Sadly, the risk Activision took with GHTV’s business model, coupled with the game’s poor sales, meant that the game will ultimately go down as a failure. Now, having been revived and tossed out for the second time, I can’t see a way back for the series after this. Harmonix is coping reasonably well with Rock Band 4 despite working with a much smaller budget than its predecessors had, thanks to a steady stream of new content and updates to the base game. With Activision and FreeStyleGames failing to properly support Live post-release,though, Guitar Hero may have just had its last world tour, and there might not be another encore planned for the series.